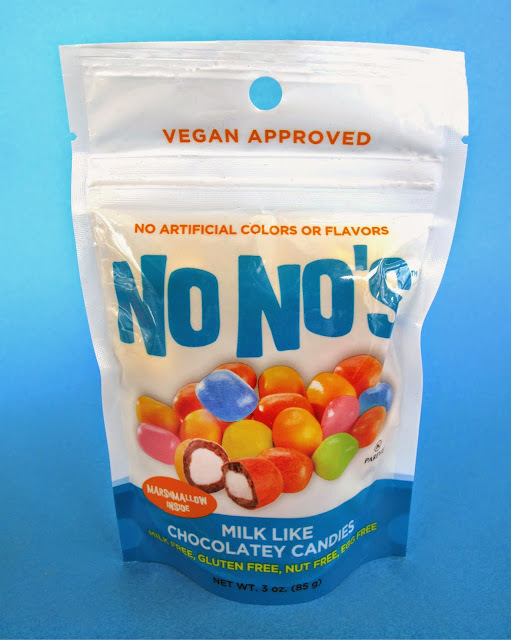 The No No's recall a flavor and colorful look of Easter candy. Kinda like malted Easter Eggs, but with marshmallows. I was really digging the flavor and can't totally describe them. Sure, they're somewhat similar to M&M's but not really. Sweet, chocolatey and marshmallowy; they melt in your mouth! And then there's the texture.... some people have complained about the bizarre shape and appearance. Premium Chocolatiers has said that they are still tweaking the shape and I'm ok with that. I think it's fun that the shapes are so random, it doesn't bother me in the least. But they may want to change the picture on the front of the packaging so people don't freak out. Bottom line: taste great, look weird, go buy them! Haha, they do look a little funky. But I'm sure they taste delicious! You cannot go wrong with vegan marshmallows and chocolate. They look like HUGE dirty Nerds. But sound pretty tasty. these look and sound delicious! i don't like that they look nothing like the photo on the package. make it obvious that whatever they were photographing for the bag wasn't the product.